The Dimension FastScan Bio™ Atomic Force Microscope (AFM) is a state-of-the-art AFM offering routine high-resolution investigation with particular emphasis on dynamic processes in liquid conditions. This becomes possible by high-speed scanning capabilities with frame rates down to 1 second. By that, the FastScan Bio platform is ideally suited for in situ investigations of soft matter such as proteins, enzymes, DNA / RNA, living cell membranes, or tissues which can be studied in dependency on environmental variations such as temperature and/or dynamic incubation. 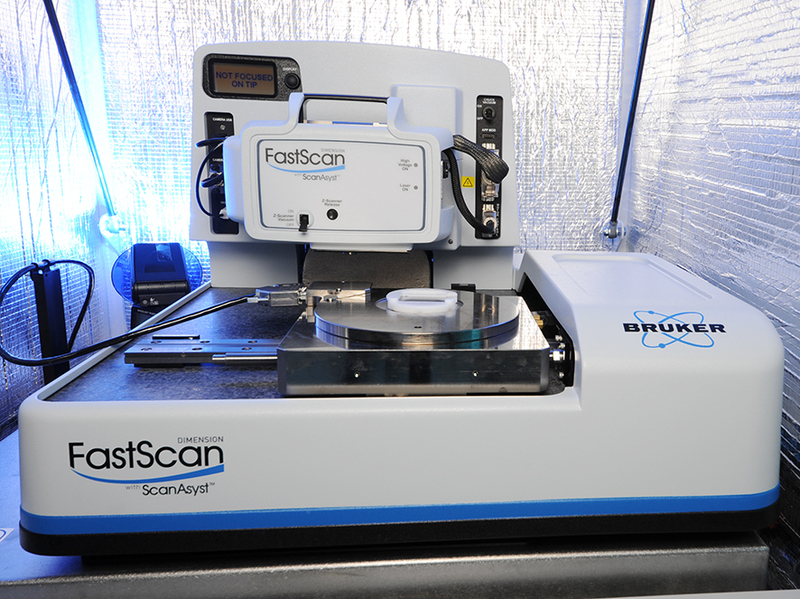 Additionally, our FastScan Bio™ is equipped with the PeakForce QNM option providing simultaneous nano-mechanical sample information like modulus, adhesion, energy dissipation, and deformation. This makes it a very capable tool for in situ dynamic surface analyses.